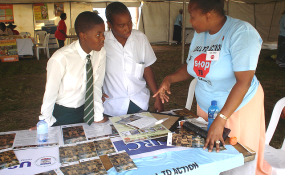 A volunteer in South Africa promoting awareness that Tuberculosis is curable. The fight against tuberculosis (TB) is drastically under-funded, with a gap of around $13 billion per year, said Deputy Secretary-General Amina Mohammed at the first-ever High-Level TB Meeting, held at United Nations Headquarters in New York. The High-Level Meeting has been described by the World Health Organization (WHO) as an unprecedented step forward by governments and all partners engaged in the fight against TB. It comes one year on from a Ministerial Conference on Ending TB held in Moscow last November, which resulted in high-level commitments from ministers and other leaders from 120 countries to accelerate progress to end the disease. Ms. Mohammed described TB as a “vicious epidemic,” which infects some 10.4 million people across the world, and is fuelled by poverty, inequality, migration and conflict. Better health and social welfare systems, and more investment, are needed to stop this global health crisis, and better tools are needed to overcome anti-microbial resistance: some 60,000 drug-resistant cases of TB are reported every year. Whilst TB affects all countries and continents, more than half of all new cases occur in just five countries: in some countries – including Mozambique, the Philippines and South Africa – there are 500 cases per 100,000 people, whilst in high-income countries there are fewer than 10 per 100,000. Ms. Mohammed said that much more progress is needed if the UN is to follow through on its promise to leave no one behind. However, progress, she added, is possible if efforts to end the epidemic are based on the best data and science, informed decisions, empowered communities, and strategic and well-financed action. Ms. Mohammed said that WHO will lead cross-UN efforts to support governments, working together with civil society and all partners to drive a faster response to TB. Just one week ago, on 18 September, the WHO released its latest Global Tuberculosis Report, which showed that countries are not doing enough to end TB, and that funding is the most urgent stumbling block. The meeting concluded with the adoption of an ambitious Political Declaration on TB, endorsed by Heads of State, which is intended to strengthen action and investments for ending of TB, and save millions of lives. Read the original article on UN. Copyright © 2018 United Nations. All rights reserved. Distributed by AllAfrica Global Media (allAfrica.com). To contact the copyright holder directly for corrections — or for permission to republish or make other authorized use of this material, click here.